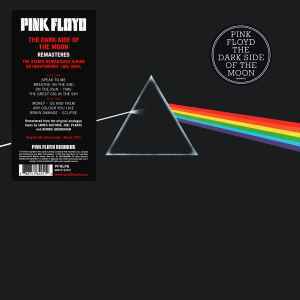 Published By – Pink Floyd Music Publishers Ltd. Published By – Imagem UK Ltd. Published By – Muziekuitgeverij Artemis B.V.
180 gram heavyweight vinyl. With original packaging. In gatefold sleeve. Includes Two rectangular Pink Floyd stickers and two posters, one of the band and another of the pyramids. Everything about this remaster/reissue is amazing. The new jacket and all the original goodies is awesome to have. The record itself sounds amazing. Very clean, definitley made very well. What can you say? Its a timeless album that has aged wonderfully. If you have an original I'd still recommend getting this reissue. Anyone who doesn't own a copy of dark side, better late than never. Excellent reissue. Very warm compared to my older Japanese pressings. Slightly lower surface noise, but I will say my 1980 Japanese repress is more detail oriented. All in all an excellent pressing with good mastering. Really amazing! Great everything: pressing, mix, sound, dead quiet, packaging, posters. The best record in my collection. Love Clair Torry. Could be one of the best paid sound tract cuts in history. Makes the album. seems to be a lot of tape hiss on run outs on side 1. (EDIT) It seems the beginning runout is hissy. I normally track at 1 gram. i can easily add a 1/2 gram. It sounds better/more dynamic with the extra 1/2 gram tracking. One of the best re-issue's I've ever heard. The package attention to detail is great and it's the best sounding record in my collection. You won't be disappointed. Stunning pressing. I have a 1973 US Harvest pressing which has seen better days and the 2003 30th Anniversary pressing which has some issues such as surface noise and warping. This pressing sounds phenomenal. Very quiet with dynamic sound and nice low end. I especially love the packaging. The gate-fold is made of a specialty matte black. I have purchased most of the 2016 vinyl reissues from Meddle up through The Division Bell and all are fantastic. Meddle and this DSOTM have very, very nice packaging. I just received this version of the album and I can say that this pressing sounds fantastic. If you're looking for a copy of this album that wont break the bank like an original pressing would you wont be disappointed. I got US version. Well made reissue. Sounds beautiful. I am always startled by clock ticking sound while listening Time. These Pink Floyd Record reissue's are amazing, this pressing has blown me away.